5 Pack - Orbit Emergency Gas and Water Shut-off Tool for Safety by Orbit at Defy Now. MPN: 26097. Hurry! Limited time offer. Offer valid only while supplies last. 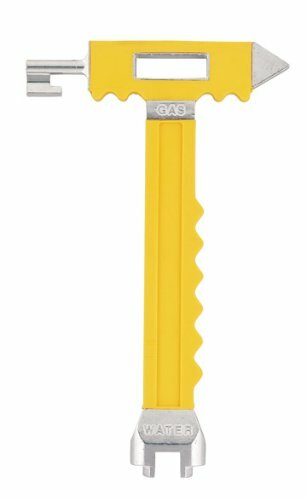 Orbit's Emergency Gas and Water Shut-off Tool is a multi-functional tool, designed to open standard sprinkler system and Texas system meter covers. Orbit's Emergency Gas and Water Shut-off Tool is a multi-functional tool, designed to open standard sprinkler system and Texas system meter covers. This tool also shuts off gas mains as well as irrigation system water mains. Features and Benefits: Made from durable metal; high quality construction, The glow in the dark comfort grip makes this the ideal tool in many situations, Made for use with standard sprinkler system meters covers and Texas meter covers; also includes a star wrench for water main covers.